Part of "Pacific Standard Time: Los Angeles/ Latin America"
UCR ARTSblock presents Mundos Alternos: Art and Science Fiction in the Americas in fall 2017. A wide-ranging survey exhibition, it brings together contemporary artists from across the Americas who have tapped into science fiction’s capacity to imagine new realities, both utopian and dystopian. Science fiction offers a unique artistic landscape in which to explore the colonial enterprise that shaped the Americas and to present alternative perspectives speculating on the past and the future. In the works featured in the exhibition, most created in the last two decades, artists employ the imagery of science fiction to suggest diverse modes of existence and represent "alienating" ways of being in the world. Mundos Alternos brings into dialogue the work of international artists from across Latin America with Latino artists from throughout the US. Drawing on UCR’s strong faculty and collections in science fiction, ARTSblock offers a groundbreaking account of the intersections among science fiction, techno-culture, and the visual arts. Mundos Alternos: Art and Science Fiction in the Americas is curated by Tyler Stallings, interim Executive Director of ARTSblock; Joanna Szupinska-Myers, CMP Curator of Exhibitions; and Robb Hernández, Assistant Professor, UCR Department of English. Kathryn Poindexter, CMP Curatorial Assistant, is Project Coordinator. This project is made possible with support from the Getty Foundation. Additional support is provided by UCR’s College of Humanities, Arts, and Social Sciences (CHASS) and the City of Riverside. Mundos Alternos: Art and Science Fiction in the Americas is part of "Pacific Standard Time: LA/LA," a far-reaching and ambitious exploration of Latin American and Latino art in dialogue with Los Angeles, taking place from September 2017 through January 2018 at more than 60 cultural institutions from Santa Barbara to San Diego, and from Los Angeles to Palm Springs. "Pacific Standard Time" is an initiative of the Getty. The presenting sponsor is Bank of America. The California Museum of Photography at UCR ARTSblock presents photographs depicting Native Americans in the Southwestern region of the United States dating to the period of the 1870s through the 1930s, including Hopi, Zuni, and Navajo peoples and cultures. Selected from the museum’s permanent collection, the photographs presented here were made by Adam Clark Vroman, Edward Sheriff Curtis, John Karl Hillers, and others. Jason Weems, Associate Professor of the History of Art at UC Riverside, will guest author an original essay to accompany the exhibition. 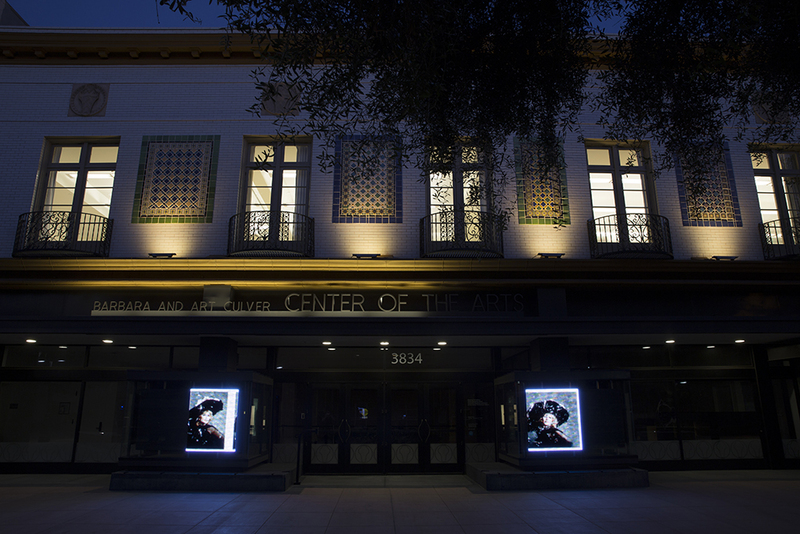 CMP Projects, about three per year, feature new or recent photography-based work on the second floor of the California Museum of Photography at UCR ARTSblock. Joanna started the series in 2013. Flash! contemporary art series features single works made within the last year by artists in all stages of their careers. 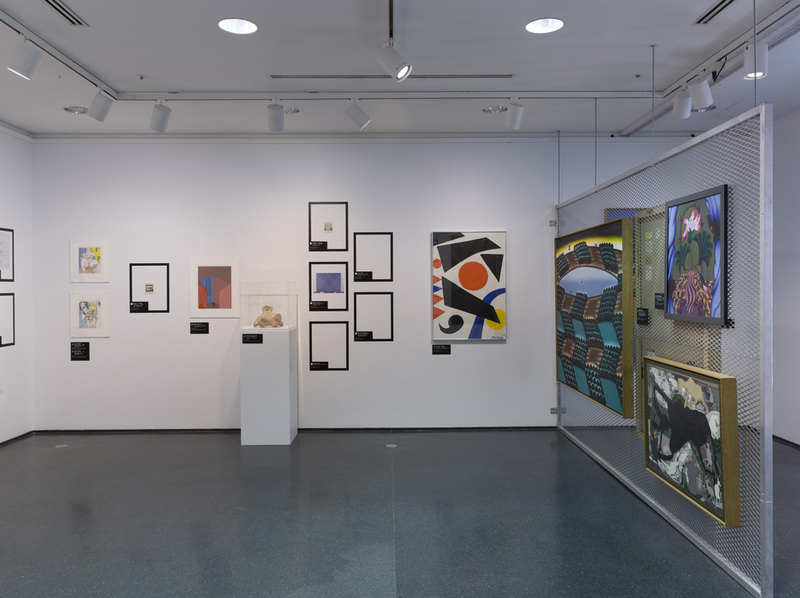 The projects, about four per year, are presented in a small gallery on the third floor of the California Museum of Photography at UCR ARTSblock. The series was conceived by Joanna in 2013 on her arrival at the CMP. Molly Zuckerman-Hartung, Rifle, 2015 (video still). Courtesy of the artist and Corbett vs. Dempsey, Chicago. A photograph is, at least in theory, infinitely reproducible. One copy is as good as the next. Provided the source material remains intact, limitless copies can be made, all of equal quality; the nine-hundredth iteration is no less true to the photograph than the very first. In art, however, photographs are almost always produced in conditions of artificial scarcity so that they can be sold in limited editions. This limitation helps guarantee the work’s value on the market, but operates against one essential character of the photographic medium. Reproduction, Reproduction brings together the work of three artists who employ photographic reproducibility as the central concept of a work. They all engage images—photographs, news images, or book illustrations—to leverage photographic reproducibility against the logic of the art market’s limited edition print. It is worth noting that Gonzalez-Torres, McMillian, and Zuckerman-Hartung are not strictly photographers, but artists who usually make paintings, sculptures, or installations; this distance from art photography’s conventions allows them to employ reproduction in a different, and pointed, way. Their projects aim to question the very meaning of reproduction by relating the reproduction of images to other resonances of the word, such as biological reproduction, in which the child inhabits the womb of the mother, and cultural reproduction, in which social institutions perpetuate norms from generation to generation. Taken together, the reproduction of images in these works becomes a complex allegory for the reproduction of the cultural status quo—in particular the perpetuation of racial, class, and gender hierarchies in American culture. Group show including work by Walead Beshty, Matthew Brandt, John Divola, Victoria Fu, Farrah Karapetian, Heather Rasmussen, James Welling, Jennifer West, and Mario Ybarra, Jr. The truth of photographs has always been conflicted. Light hits sensitized paper to produce a picture of the world, capturing a moment in time. This was here, every photograph asserts. But the picture is flat and static, bound by edges and defined by depth of field, reproducible and variable in size: an artificial organization of a world that is spatial and temporal. Nevertheless, this was here. Since photography was invented, it has carried with it this elemental condition of “indexicality.” A photograph must exhibit some element of proof, some trace of reality, to be a photograph. Many artists using photography today are grappling with this complicated state of photographic truth in ways that confront the typical expectations we may have of photographs. It seems that photographs alone can no longer secure their truth claim simply by accurately depicting the world in two dimensions. Through additional maneuvers artists privilege the index over pictorialism, pushing their resulting pictures even to complete abstraction. The activity of the artist is registered loudly in each work; This was here is now I was here. Celebrating the CMP's fortieth anniversary, Around the World in Forty Pictures takes as inspiration the classic novel Around the World in 80 Days by Jules Verne, first published in 1873. This tale of adventure chronicles the fictitious travels of a British gentleman Phileas Fogg and his French valet Jean Passepartout. The exhibition Around the World in Forty Pictures, as the title implies, culls forty pictures from the Keystone-Mast Collection (part of the CMP permanent collection) to retrace the steps of Verne's colorful characters as they circumnavigate the globe. For this project Miranda Beltrán investigated eight historical moments of political unrest culled from the history of Chicago: the Haymarket Riot (1886), Pullman Strike Riot (1894), Chicago Race Riot (1919), Memorial Day Massacre (1937), Martin Luther King Riot (1968), Democratic Convention (1968), Days of Rage (1969), and the Humbolt Park Riot (1977). Chicago is My Kind of Town emphasized the links and differences among past social situations and those of the present. The exhibition’s title explicitly conjures the protests surrounding the NATO Summit in Chicago in May 2012, policed by officers delivered to the location in municipal buses flashing a slogan from the song recorded by Frank Sinatra in 1964, “My Kind of Town.” Like the public crises of the past, these events manifested distress and hope, failure and transcendence, rupture and kinship. 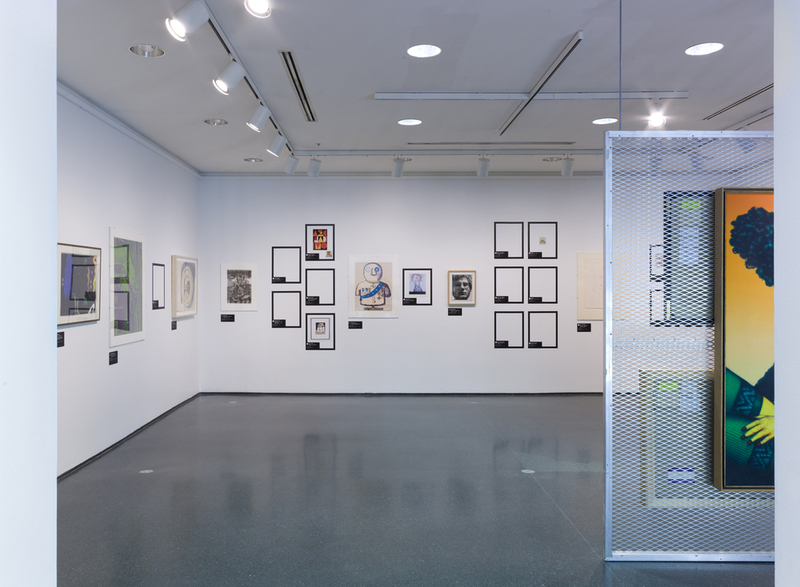 This exhibition investigated the early collecting practices of MCA Chicago, and included works by Enrico Baj, Roger Brown, Alexander Calder, Chuck Close, Marisol, Ed Paschke, and Larry Rivers, among others. In 1977, the MCA invited Gordon Matta-Clark to transform a residential brownstone that the museum had recently purchased to convert into additional galleries. Matta-Clark was at the time known largely for guerilla projects in which he cut into abandoned buildings to create what he described as “anarchitectural” installations. In January 1978, with a crew of helpers, Matta-Clark cut through floors, walls, and roof, exposing the building’s interior to sun and snow. He called the work Circus, alternately titling it The Caribbean Orange to reflect its spiral form. Matta-Clark’s intervention was open to the public for two and a half weeks in early 1978, during which time MCA security officers led tours along a predermined route. As planned, this temporary work was covered up with the renovation of the annex. A single photograph could not capture the complicated design of this installation; one had to walk through the building to experience it fully. As the title Circus suggests, Matta-Clark conceived of the work as a spectacular performative event in which the viewer could take part simply by moving through space. Just as he used existing buildings as material for his work—in his own words, “rethinking what is already there”—he then used photographs of that work as source material for collages, creating many related artworks in an attempt to convey the feeling of his building cuts. 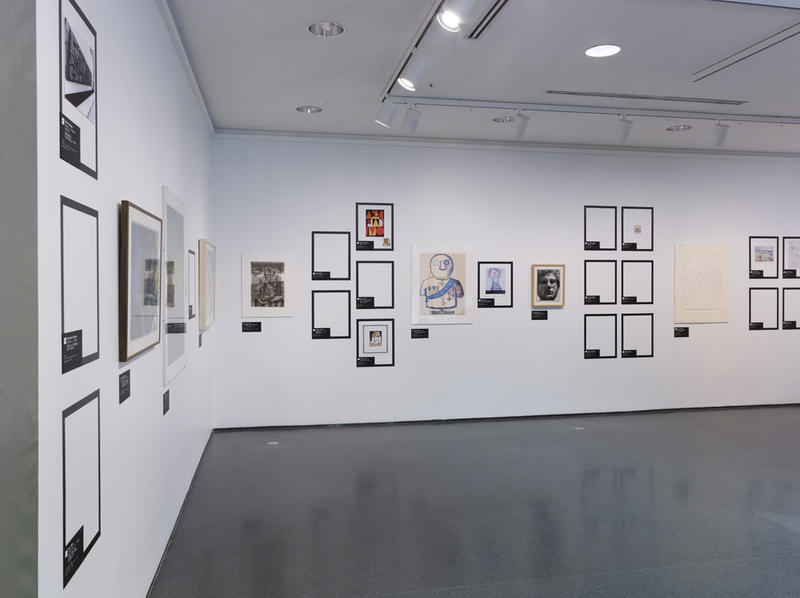 The photomontages and collages on view in this exhibition demonstrate his attempt to grapple with the physical logic of what he had created. 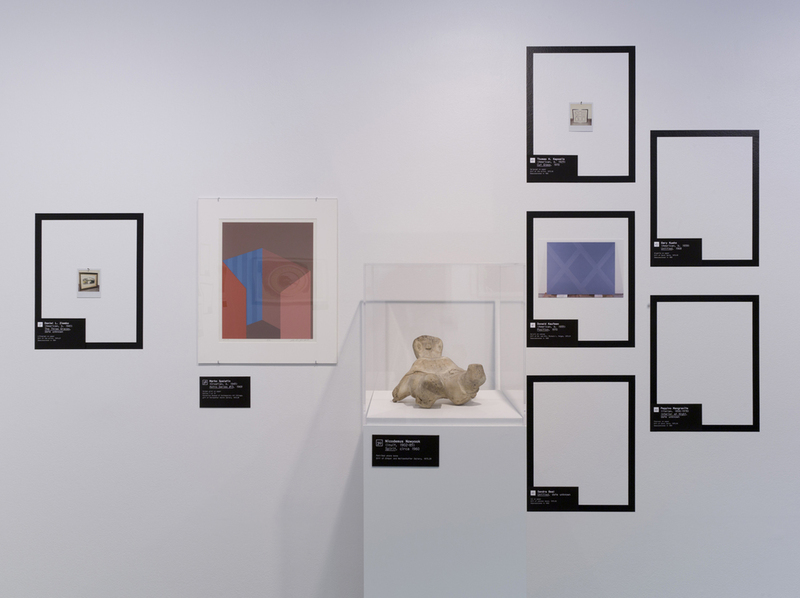 The materials on view in this exhibition explore the collaboration between artist and curator in the creation of this building alteration, a radical project that exemplifies the MCA’s strong history of working closely with artists to present experimental exhibitions. These works constitute an important part of the MCA’s historical identity. Tragically, the project proved to be the artist’s last; he died of pancreatic cancer, at the age of 35, later in the year 1978. We have as much time as it takes was an exhibition of works by 10 international artists and collectives, co-curated by the graduating students of the Graduate Program in Curatorial Practice at CCA, and presented at the Wattis Institute for Contemporary Arts, San Francisco. 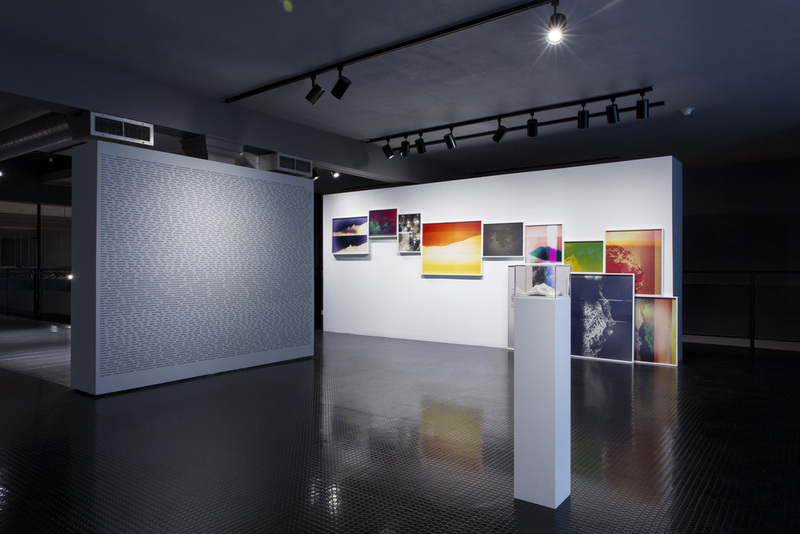 Many of the works were new, site-responsive commissions created especially for the exhibition, and called attention to the multiple conditions that determine artistic display in the Wattis Institute. 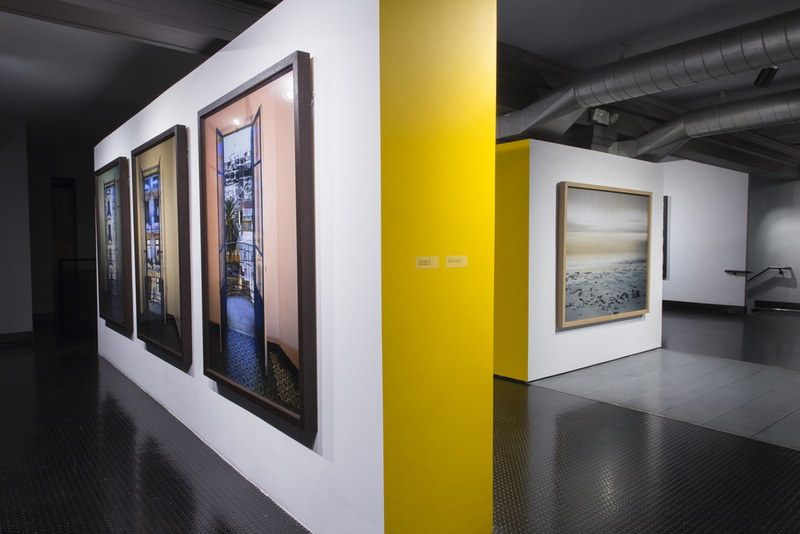 As an art gallery located within an educational institution, the Wattis Institute requires the steady production of tangible, professional results. Responding to this demand, We have as much time as it takes presented practices that exposed—directly or symbolically—the often unquestioned and overlooked systems and economies related to such a situation. We have as much time as it takes questioned and highlighted expectations of achievement, productivity, and established systems of management that make up the programs and academic mission of the Wattis Institute and CCA. The artworks converged and intersected in ways that confronted exhibition-making’s usual emphasis on visibility and timeliness, not to mention academic and institutional deadlines. The works embodied circular processes, resisted completion, welcomed change, and refuted demands for definable results and resolution. They challenged the conventional form of the art object and the traditional parameters of exhibitions. NAIL (Not Always in Location) was initiated by the MA students in Curatorial Practice at CCA in September 2008. We executed five projects as the NAIL curatorial collective, working together until May 2009 under this name. The group’s purpose was to experiment with exhibition forms in a workshop setting, the results of which were shared with the public in a variety of venues. 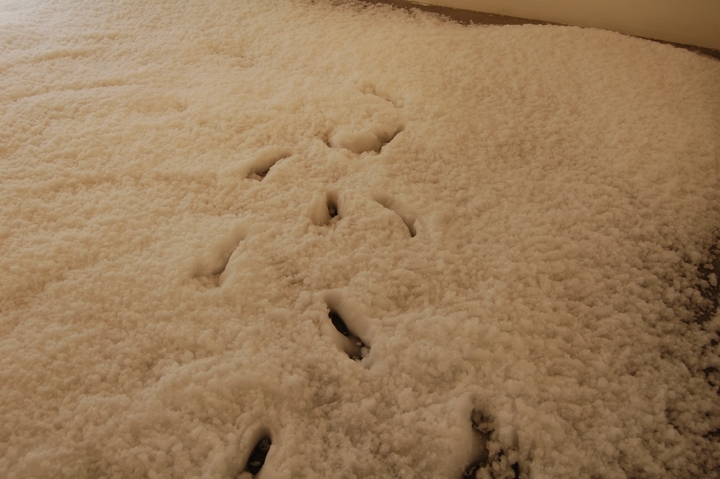 NAIL 1, entitled Home Sweet Home, took place in October 2008 as an apartment show, engaging ideas of personal and private space. NAIL 2, Surrounding Area, took the form of a walking tour, divulging to participants little-known details about the Potrero Hill neighborhood in San Francisco. NAIL 3, Out of Order, took place in the more traditional art setting of the PLAySPACE graduate student gallery at CCA, but our concept was all but traditional; we chose artworks through the “Exquisite Corpse” method developed by the Surrealists. For our fourth project, we were invited by independent curator Jan Van Woensel to curate an email exhibition in conjunction with his show Bad Moon Rising 3 at Boots Contemporary Art Space in St. Louis; every day for two weeks in January 2009, viewers received an email containing a single curated artwork. NAIL V (self-titled) was our final project. It began as a response to philosopher Boris Groys’ essay, “The Loneliness of the Project,” and manifested in a non-traditional publication. I love you more now that you’re gone was an interactive installation by emerging conceptual artist Allie Bogle, curated by SVLAP Gallery Director Joanna Szupinska. 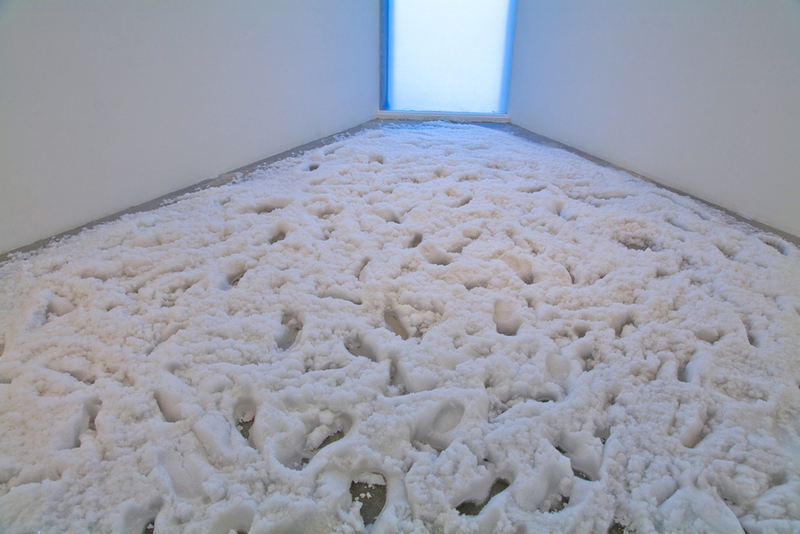 The work consisted of covering the floor of an entire gallery with artificial snow. Based on this exhibition, the artist was invited by curator Valerie Cassel Oliver to recreate the installation at the Contemporary Arts Museum in Houston as part of a two-person exhibition in 2008.